Web applications are a type of software that is encoded in a language supported by web browsers and whose execution is carried out by the Internet. Web applications are intimately related to the storage of data in the cloud, since all information is stored permanently in web servers, which in addition to hosting this information, send it to our mobile devices or computer equipment at any time that is required, making temporary copies of these shipments within the equipment and devices that we use. The companies that rent these spaces in web servers are known as companies or hosting services. Saving time: They are simple to manage, so they allow tasks to be done easily without downloading or installing any additional program or plugin. Full compatibility: They are fully compatible with browsers to be able to use them. It is usually required that the web browser is properly updated to use this type of Apps. Continuous and immediate update: Due to the fact that it is the own developer App that manages and controls the software, the version that users download, install and use, will always be the last one launched by the developer App. For this, it is essential to be aware of what happens with the App. Data recovery: One of the greatest advantages of a Web App is that, in most cases, the user can retrieve their information from any device and place with their username and password. Savings of resources in equipment and devices: Web Apps, generally has a low consumption of resources since all (or a large part) of the application is located on a web server and not on our computer. This type of web App show very little information and usually do not very much (although they can show somewhere in the same objects in movement, such as (banners, animated GIFs, videos, etc.). Keep in mind that modifying static Apps is not easy, and even less with the limitations that this type of App development platforms usually present and the limited experiential and personal contribution that only a professional can transmit and take to out at the time of developing your App. A dynamic web application is much more complex to create and develop technically than a static web App because they use databases to upload information so that the contents of the Web App are loaded and updated each time the user accesses to the same. What is a content manager or CMS? CMS stands for Content Management System is a program developed for which any user can manage and manage the contents of an App (also from a website) easily and without knowledge of Web programming for Apps. 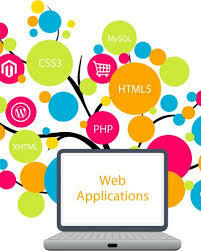 It is essential for the development of web applications in which the content must be continually updated. It is a platform with a very intuitive use that has a large number of users in its community and great benefits. It is a free software content manager, which makes it very adaptable. It is especially recommended to generate communities and forums. A mobile portal App Web, is a site or web page for mobile devices, that is, it is very similar to a normal website, but designed for the screens of this type of devices that are smaller, so that the contents ( as images, videos, etc.) are optimized to fit these requirements. Optimized for mobile devices (small screens). Compatibility with all operating systems currently available. The development is similar to that of a website oriented to e-commerce. That is a Web App based on an online store, or also called M-Commerce or mobile commerce. This type of Apps also has a CMS or management panel that the developer App must also create, from which you can upload the products, update or delete them, manage orders and payments, etc. It is one of the most used technologies by designers, creatives and developers App because it allows presenting the contents of the Web App with animated effects of all kinds and very creative and modern designs. It uses Flash technology for animations. They have a very important drawback, and that is that SEO positioning is much more complicated since this type of technology is not the most suitable for it.